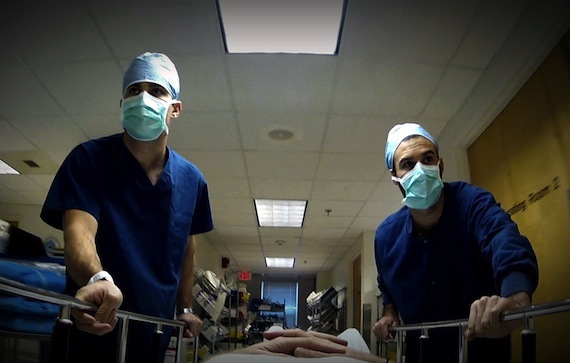 Escape Fire: The Fight To Rescue American Healthcare, a documentary by Matthew Heineman and Susan Frömke, sets out to not only expose what ails the American healthcare system but also provide what the film posits to be creative solutions. Unfortunately, due to the byzantine nature of the subject matter, Escape Fire develops a strong case of The Corporation-itis: attempting to cover too much ground and sacrificing a strong cohesive story arc in the process. The film’s title is a riff on the concept of an escape fire, which are lit to clear an area of grass in the face of an approaching wildfire. It creates a safe space with nothing left to burn in it; in other words, an inventive solution to a thorny problem or as the film’s website states, “an improvised, effective solution to a crisis that cannot be solved using traditional approaches.” This begs the question, however, about how “untraditional” the film’s solutions are: prevention rather than disease management, a lifestyle overhaul, and a move away from reliance on medications are ideas quite prevalent in the health-talk zeitgeist and, thus, not particularly innovative. Still, the breadth of topics covered by Escape Fire is impressively thorough: physicians’ fees, inaccessibility of health insurance, prevention vs. mere disease management, over-reliance on drugs, insurance companies’ focus on profit margins at the expense of patient care, patients’ insistence on expensive testing, maximum care, quick fixes, the rise of diabetes as a result of unhealthy eating habits, and the political stranglehold of the health care industry’s lobby. Despite its penchant for positing truisms and rehashing topics better covered elsewhere, Escape Fire does bring up some great points. For example, the fact that other developed countries spend $3000 per capita on health care per person while the US spends $8000, yet is ranked fiftieth world-wide in life expectancy indicates the disparity between expenditures and actual health outcomes. The film argues that the fee-for-service system currently in place rewards physicians for doing more, expensive-test-wise; on the flip side, primary care in America is in great danger as primary care physicians are barely able to earn a living while specialists earn significantly more. This essentially endangering the livelihood of the people most needed to do preventative care. The film also takes a hard look at the pharmaceutical industry (the US spends 300 billion on drugs annually) and examines the issue from both sides—the almost limitless political power wielded by Big Pharma and the patients’ own penchant for panaceas and quick-fix pill solutions. The section on lifestyle changes and nutrition awareness is no uncovered ground and probably far better covered in other documentaries, but experts are clearly on to something with the fact that nutrition education is currently omitted from medical education. As a result, physicians are unable to advise their patients on such topics. While interviews with well-recognized experts such as medical journalist Shannon Brownlee and others paint a sobering portrait of a system in dire crisis, it is the personal stories of people caught in it that pack the more poignant punch. The story of Sgt. Robert Yates, returning from combat in Afghanistan with physical injuries and PTSD so severe that he literally clutches a plastic bag full of dozens of medicines next to his chest, is the most visceral commentary on the depth of the problem. His path to recovery through meditation, acupuncture, and yoga speaks volumes about an often unreported story: the Army’s deployment of therapies that more conventional care givers are still reluctant to use. The story of Dr. Martin, a physician increasingly under pressure by Medicare to spend less and less time with her patients (the standard she is told to uphold is seven minutes per patient) illustrates the film’s theme that our “health” system is really a “disease management” system. Escape Fire may not offer much in the way of outside-the-box solutions and it may be a bit scattered in its approach, but it is startling portrait of a very diseased system.